Children can memorize just about anything without even trying. When my children were very young they loved to watch the same video programs over and over again. Before long they knew most of the dialogue word for word. The same can be done with Scripture memorization; so let us take advantage of this innate ability and plant God's Word into their hearts and minds as soon as we can! One of my earliest childhood memories is of the Twenty-Third Psalm. When my mom would tuck me in at night she would say the Twenty-Third Psalm, and then pray with me. Eventually I could say it with her. I was only four years old at the time, yet I had memorized the entire passage just by hearing it repeated! If God's Word is a lamp unto our feet and a light unto our path, then Scripture memorization should be at the forefront of children's ministry. After all, we are instructed to hide God's Word in our hearts so that we don't sin against him. Over the next several days (or weeks if you teach the series once a week) we will . 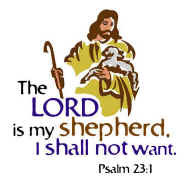 . .
Continue reading The Good Shepherd Bible Lessons.